John Wehausen was a pioneer and international leader in free-surface hydrodynamics. 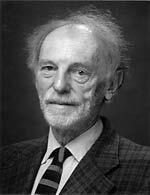 An online version of his classic work "Surface Waves," co-authored with the late Professor Edmund Laitone of ME, is posted at the College web site. UC Berkeley's official obituary on John Wehausen can be seen at the UC Berkeley News Center. On December 12, 2005, U.S. Senator Diane Feinstein entered a statement honoring Professor Wehausen into the Congressional Record. This scholarship will be awarded to ME graduate students when the start-up target is reached. Courtesy of the Technical University of Hamburg - Harburg, the Wehausen Scholarship holders will receive complimentary subscriptions to the Journal of Ship Technology Research (Schiffstechnik). Official tribute to John Wehausen by the Academic Senate of The University of California.